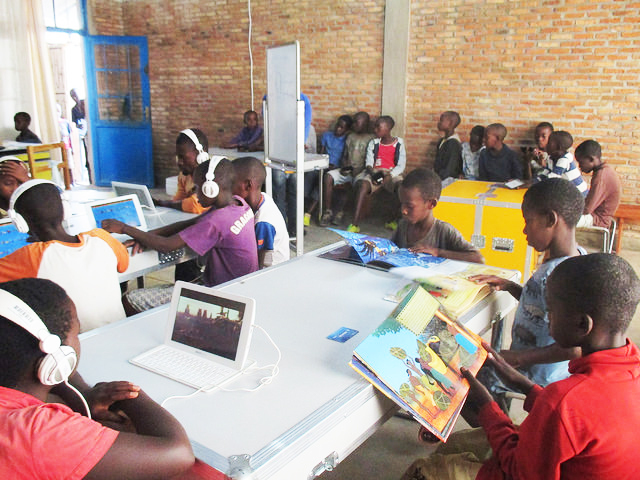 » Libraries Without Borders Chosen for Humanitarian Education Accelerator! Libraries Without Borders is pleased to announce that it has been selected to participate in the UNHCR’s Humanitarian Education Accelerator (HEA). This initiative aims to develop a cohort of successful humanitarian innovators and strong evidence base of effective methods to scale and evaluate programs for refugee education. LWB is one of only two innovation teams chosen for the second cohort of this accelerator, which is the first of its kind to support cutting-edge education innovations ready to scale in humanitarian emergencies. LWB was identified for its innovative work on the Ideas Box, a transformative technology that tackles systemic challenges faced by refugees around the world. HEA seeks to help the humanitarian community understand how to transform good pilot projects like the Ideas Box into scalable education initiatives that can help refugees and displaced communities worldwide. The Accelerator will investigate how the Ideas Box links to other education programming, and how its various components impact learning. As a participant in the Humanitarian Education Accelerator, LWB will receive tailored mentorship on the scaling process, the opportunity to take part in an annual boot camp on building capacity, a fully-funded external evaluation, and up to £300,000 in financial support to assess the organization’s evaluation capacity. HEA was forged out of a partnership among the Department for International Development (DFID), the United Nations Children’s Fund (UNICEF), and the United Nations High Commissioner for Refugees (UNHCR). Libraries Without Borders is an international nonprofit organization. Founded in 2007, it has become one of the world’s leading NGOs working to expand access to information and education to vulnerable populations around the world. We have worked extensively in Central Africa, Europe, and the Middle East and are expanding our operations to communities in the United States and Latin America. Our innovative creations include the Ideas Box, a portable multimedia toolkit designed for vulnerable communities. Designed by LWB in collaboration with designer Philippe Starck and the High Commissioner for Refugees, the Ideas Box is a standardized, easily transportable and deployable media kit for use on the ground. It is a robust and energy-independent device that provides curated content that is customized to meet the needs of the people, their language, and their culture. By providing access to the Internet, books, teaching resources and multimedia, the Ideas Box provides people with essential tools to build and imagine their futures.